Dear Colleagues, I am pleased to announce the appointment of Dr. Tim Fryer as the new Principal (Head) of the Overseas Chinese Academy Suzhou. Thanks to all of you who sent in recommendations for candidates to consider. As always your collective int was extremely valuable. "Tim joins Overseas Chinese Academy Suzhou from his current position as Secondary School Principal at The British School, New Delhi. He has over 30 years of experience as a teacher and leader at international schools in Africa, Europe, East and South Asia and the Middle East. An IBDP Chemistry teacher and examiner, Tim has taught in IB schools for most of his career, and has served in both CAS and DP coordinator roles. He has many years of experience as a pastoral care leader and is a strong advocate for the inclusion of outdoor experiential education, community service and enrichment activities as key components of a broad and balanced programme. Tim has a BSc in Applied Chemistry, PGCE in Chemistry, an MA in Education and holds a Doctorate in Education awarded by the University of Leicester, UK. His master’s dissertation evaluated the effectiveness of PSHE programmes and his doctoral thesis explored dual-language, Mandarin and English international education in the Hong Kong context. He shared his thesis findings in an article published in the Journal of Research in International Education. Tim is an experienced CIS visiting team member and has also led accreditation processes in his own schools." Overseas Chinese Academy (OCA) is a series of schools catering to the educational needs of the children of overseas Chinese professionals who return to China to live and work. Founded in 2016, Overseas Chinese Academy Suzhou (OCAS) is the first school in the world specifically designed to cater to the international education needs of the children of overseas Chinese returnees. From August 2017, OCAS is offering classes in Grades 1 to 5 to 280 students who were competitively selected. From August 2018, OCAS will have classes from Grades K to 11. OCAS is located in Suzhou, the “Venice of the Orient”, about 30 minutes by high-speed train from Shanghai. Overseas Chinese Academy Wuxi (OCAW) is located in Wuxi, about 30 min by high-speed train from Shanghai and Suzhou. Set to open in 2018, OCAW will be the second of the OCA series of schools. One or two other schools are also starting in other locations in China under the same umbrella of the Overseas Chinese Academy. The schools are at exciting stages of development and have great aspirations. We are seeking to employ outstanding individuals who share our vision and mission and can make the most of these unique opportunities. The successful candidates will be charged with guiding each of the schools to achieve its mission, playing a leading role in the development of the long-term strategic and annual action plans for the school. S/he will have overall responsibility for educational and day-to-day management of the school, including the academic, co-curricular and residential programmes, student welfare, operations, facilities, finance and accounting. Website -- www.ocasuzhou.net and click on “English”. With Chinese origins and global originality, OCA is committed to developing students’ potential in creativity, innovation and originality and enabling them to deal with the international problems of the 21st century in cooperation with young people from other countries. Overseas Chinese Academy aspires to become a model of Chinese International Education. We draw on collective wisdom to select, study and integrate the “B-E-S-T” elements from Chinese and international education. Each House consists of students from different grades and is supervised by Mentors who are subject teachers. Mentors are responsible for creating a bilingual international boarding environment, providing high quality and individualized pastoral care. Encourage students to become future leaders, who will strive to resolve 21st century global issues cooperatively with young people from other countries. Scholarships: We provide a variety of scholarships to encourage diversity and celebrate achievements. Post entry, teachers will be able to continue to improve their skills through collaborative planning, in-school training, job-alikes, peer support, feedback from colleagues and leadership training. The school in Suzhou opened in September of 2017. It will occupy a unique position in the Chinese educational landscape, since it is the first school established in the world which is specifically designed to serve the education needs of the children of overseas Chinese who return to China to work and live. With 280 students from Grades 1-5, around half of the students are the children of overseas Chinese returnees, of whom around 90% have obtained Masters degrees or above from their own overseas studies. Admission to the school in Suzhou was competitive and based on OCA selection criteria. It is anticipated that schools in other locations will have similar family backgrounds. All students in K-5 will be day students, while students in lower secondary can have the option of being day or boarding students, but all students in high schools will be boarding students who can go home on weekends. The Principal will be responsible for recruiting and selecting students to be admitted to the school in accordance with central OCA admissions policies, standards and practices. OCA will provide 12-15 years of continuous K-12 dual-language education, emphasizing the development of both Chinese and English as students’ mother tongues. 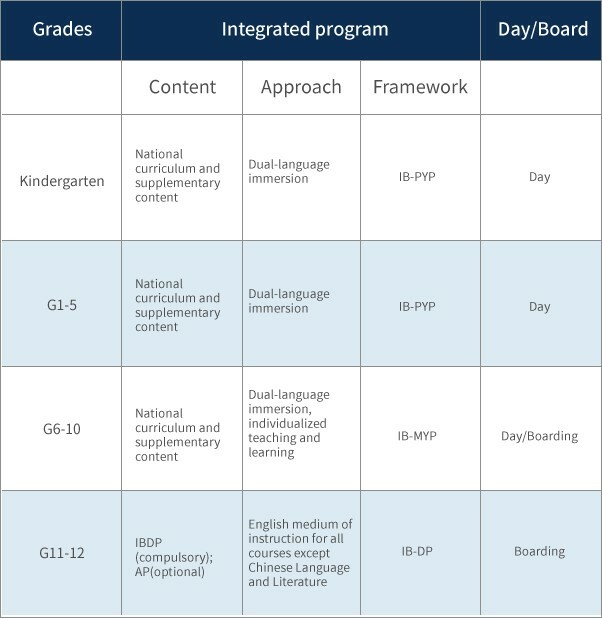 The OCA curriculum draws from both the East and the West – established on the basis of the Chinese national curriculum, characterized by American innovative curricula, and integrated within the International Baccalaureate (IB) framework. The education of students over and beyond their academic lessons is a defining characteristic of an OCA education. Supporting this philosophy are the number and breadth of opportunities provided for OCA students for learning outside the classroom. There will be a particular focus on activities that promote understanding of China and Chinese culture and initiatives that develop innovation and creativity. The residential program will be an integral part of the overall educational experience for the secondary school students. Students from different backgrounds will live together in 4-person dormitories on campus under the care and guidance of Houses Mentors and other staff. All high school teachers are expected, when needed, to live on campus and be part of the residential community. Suzhou combines its rich 2,500-year-old history with a drive to become one of the most modern cities in China. Suzhou is one of the most culturally rich areas of China, with UNESCO World Heritage gardens and canals famous around the world. Alongside its beautiful classic gardens, Suzhou has many excellent learning resources and sports facilities and a broad range of choice of shopping malls, cinemas, restaurants and bars. Wuxi borders two other large cities, Changzhou to the west and Suzhou to the east, and borders Zhejiang Province as well in the south. It also covers a coastline of the Yangtze River in the north and two separate coasts of Lake Tai. Wuxi is well known for being one of the birthplaces of China's modern industry and commerce, as well as the hometown of many important businessmen who have played essential roles in building commerce in Shanghai since the early 20th century. OCA is in the process of establishing schools in other locations in China. A leading-edge Science, Technology, Engineering, Arts and Mathematics (STEAM) centre. Faculty and student residences will offer both private and communal living spaces. Extra space will be given to faculty residences for meetings and sharing meals with students. The OCA team consists of teaching faculty and administrative staff who have diverse experiences in Chinese and western education, bilingual education and whole-person education. They are curriculum development leaders and teachers with a spectrum of experiences and expertise. They come from local and international schools with different education systems and curriculum frameworks. Staff at OCA schools come from many different countries and are expected to be actively engaged in the co-curricular and residential programmes of the school in addition to teaching classes. The Principal will be responsible for recruiting and leading all academic and operational staff in accordance with OCA policies, standards and practices. The Principal will live close to the students and academic staff and is expected to be an integral part of the campus community. OCA values its staff’s professional development and will allocate appropriate resources to ensure that academic and operational staff are able to further develop themselves. In addition, it plans to collaborate closely with IB Asia-Pacific to hold regional IB professional development workshops for administrators and teachers. OCA schools are not-for-profit, non-governmental, independent schools. The Board is the ultimate decision-making authority of the school, but it does not get involved in the day-to-day management of the school. While the statutory principal of the school is required by law to be Chinese, the Principal enjoys significant autonomy in the daily operations of the school, including the academic, co-curricular and residential programmes, facilities and support functions. To assume overall responsibility for educational and day-to-day management of the school. The Principal will be appointed by the Board of Directors. The contract will be for 3 years. Additional contracts may be negotiated by mutual agreement. We are particularly seeking individuals who will be inspired by the opportunity to help to develop a brand new Chinese international school. Applications should be sent in the first instance to Dr. Barry K Drake at bdrake@searchassociates.com (copy to hr@ocasuzhou.net). The application should include a detailed CV, a personal philosophy of education and the names and contact details of three referees. Application Deadline: November 30, 2017. Please note, however, that OCA reserves the right to make an appointment before the final deadline date if a suitable candidate has been identified.